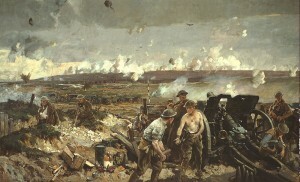 The Battle of Vimy Ridge, a painting by Richard Jack. Canadian War Museum. The week of April 9-13 is important for marking two major events in history: the 100th anniversary of the sinking of the Titanic, and the 95th anniversary of the battle at Vimy Ridge. Both events have as of late been dominating the media coverage, one in particular, the Titanic, more than the other. Underlying the coverage of both of these events is the actual history that seems to have gotten lost. As historians, we want to see that people are actually thinking critically and being provoked to ask questions; not simply accepting the material that is being presented. The Titanic was more than just an ocean liner sinking. It is a story that encompasses topics about class, race, and gender in a society that is not that far removed from our society today. We should be thinking about and discussing these issues in relation to how it was representative of the society of the time. Equally important, in terms of Vimy Ridge, are the countless other battles fought in World War I that showed the strength and collectiveness of our nation. Are they not as important? Can and should the battle of Vimy Ridge be the most significant representative moment of this war? Should we not honour the other battles with the same respect? What has become an issue is that these events seem to have gotten coverage based heavily on the fact that they are considered milestone occasions. The one hundredth anniversary of an event seems to always be glorified and promoted in the news, simply because one hundred years has been presented in our society as the accepted date with which something should be remembered. Should the number behind the anniversary of an event automatically make it more important than the significance of the events’ history? If we examine this idea further, this year marks the 200th anniversary of the War of 1812. Though it is often argued, and has been the main focus of many of the speeches this week, that it was the Battle of Vimy Ridge where Canada finally came together as a nation, did the War of 1812 also not have a significant impact that has shaped our cultures consciousness of who we are as Canadians? News coverage of this has slid significantly in the past few months, with this historian only hoping that the next few months bring a significant turnaround in this matter. One of the most telling and perhaps frustrating aspects of this is that Canada Post, instead of choosing to commemorate the Battle of Vimy Ridge as a postage stamp, chose to go with the Titanic. Why? The argument lies in the fact that after the ships sinking, two of the first vessels to start the recovery effort of the victims were sent from Halifax, Nova Scotia. There is also a graveyard that is the final resting place of 150 of the ships unclaimed victims. The Halifax branch of Canada Post outfitted mail trucks and created a 100th anniversary collection line of stamps. Does this small role that Halifax played in this event justify the efforts that are being put in place for this commemoration? Does this actually show respect for the event or is it just a way of capitalizing on all of the hype that is surrounding this anniversary? If this is the way in which we choose to commemorate significant historical events, will the Battle of Vimy Ridge receive the same treatment in five years? And if so, will it be to capitalize on the number associated with the anniversary, or will it be to reflect on the true meaning behind the historical importance and implications of the battle? Yet, there is still hope. Upon reading one of the few articles that focused on the memory of Vimy Ridge, it highlighted the over 5,000 Canadian students who made the journey to Vimy to remember. Perhaps all is not lost. Perhaps there is still a desire out there, by these young people in particular, to keep the memory of important and more importantly the historical significance of events such as this alive in our national narrative. There may be no re-release of a movie in 3D that glorifies this moment in Canadian history and, this may be for the better. Events such as this are not to be glorified, they are to be respectfully remembered. Though they may not get as much coverage as some more ‘popular’ historical events, there are people out there, and in particular young people who are not willing to forget. There needs to be a shift in the way in which we choose to remember and commemorate. We need to alter our thought process by finding a way to prioritizing our remembrance, not popularize it. Laura Piticco is completing her MA in Public History at Western University in London, Ontario. Her personal website can be found here. Why are academic historians so hard on the Titanic? It was one of the worst maritime disasters in history. It deserves a 3d movie and a song. And a stamp for that matter. Nova Scotia played an important role in the recovery efforts bringing back almost 200 bodies of those who perished and being a site of commemoration for the families of those who were lost – I don’t agree that Halifax’s role was small. What’s also amazing is that Halifax has continued to keep the story of the Titanic alive since it happened, preserving the archive and presenting the history of the tragedy at the maritime museum (even before the film – I know ’cause I learned about it every year in grade school). As an Australian historian, I was interested by your comment about Vimy Ridge (which I must confess that I hadn’t heard of) and that it marked “where Canada finally came together as a nation”. In Australia, Gallipoli is being increasingly hyped as the place where Australia too “became a nation”. Australia had only federated in 1901, and so a presence as Australians (rather than as soldiers of the separate colonies) during WWI was probably the first big international event where a national presence was noted. I’m surprised, though, that the same comment is made about Canada?